Giveaways You Could Actually Win! 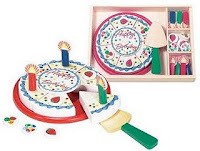 Giveaway for the Melissa & Doug Birthday Party Play Set ends TONIGHT at 10 p.m. MST! Enter here. Seriously, isn't that the cutest toy!? Also I decided to make my Low Entry/Ends Within a Week Giveaway list a tab. Another favorite blog of mine, My SLC Mommy, has 3 giveaways going on now with low entries and they all end within a week!